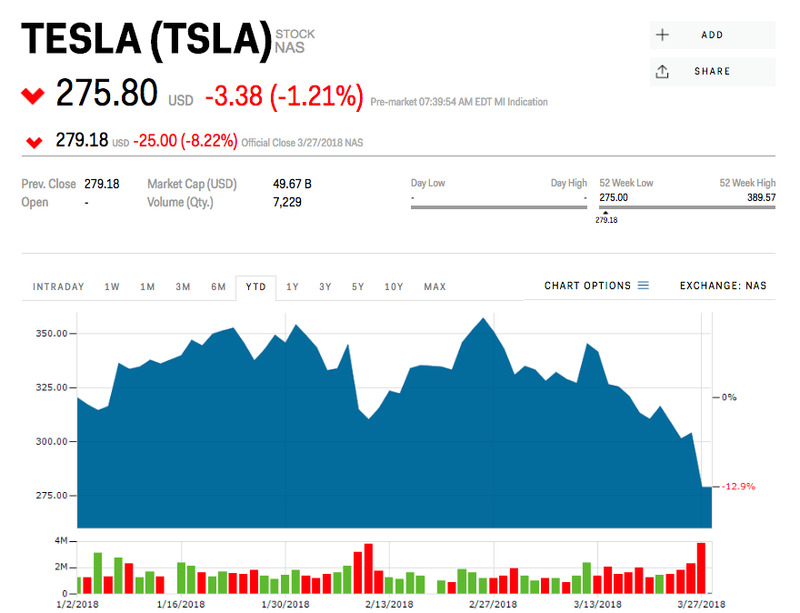 Tesla is trading lower by 1.21% after getting downgraded at Moody’s. The rating agency lowered Tesla’s corporate rating one notch to B3, citing a “significant shortfall” in Model 3 production. Moody’s could downgrade Tesla further if it continues to miss production targets. Tesla shares are sliding Wednesday, down 1.21%, after the electric-car maker was downgraded by Moody’s. The rating agency lowered Tesla’s corporate rating one notch to B3, citing a “significant shortfall” in Model 3 production, Reuters says. It also slashed the car maker’s junk bond rating to Caa1, just one notch above default. Tesla faces further downgrades if it falls behind on production targets, Moody’s said. The downgrade comes as Tesla has been grappling with “production hell” for its Model 3 vehicle. The company initially promised the production of 20,000 Model 3 vehicles per month by December 2017, but only delivered 1,550 in the entire fourth quarter of 2017. Tesla now says it will build 2,500 Model 3 vehicles per week by the end of the first quarter, and hit 5,000 per week by the end of the second quarter. And the bad news may not be over yet for Tesla shares. Shares of the electric-car maker have been hit hard in recent weeks, sliding 22.45% from their February 27 high. They are down 10.33% so far this year.